I used to look at colorful drawings hanging on the fridges of my kid-having friends and think “Meh. It’s cute I guess.” But when I held that first piece of art, I realized that it didn’t matter if it was cute. It was her. It went directly on the fridge. So did the second drawing, and the third. 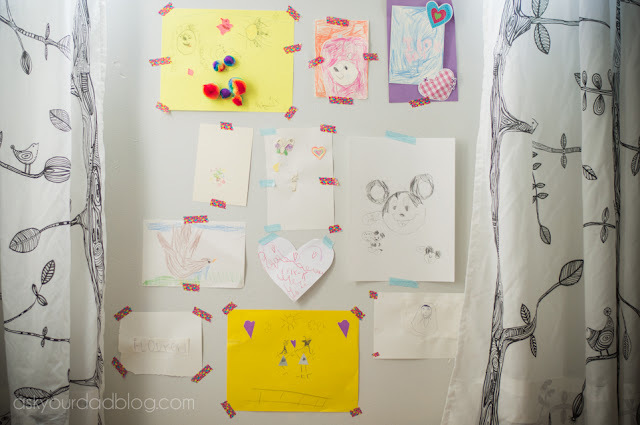 Eventually when the fridge filled up and a combination of gravity and crappy magnets forced me to take down the older ones I’d walk over to the trash can, look at it for a second, then walk away from the trash can deciding that the pictures could live on top of the fridge. When the top of the fridge filled up, I went and found a box… and another box. I know. I had a problem. But these pictures were the glitter and glue covered footprints my little girl had left of a life where she could barely count to fiveteen. Every day they got better. An almost circle became a face. A face grew legs, then a body. Lines became houses. A sun. A moon. Planets. She was creating the world around her. She put it in crayon. I put it on our fridge. We were running out of room. As she got bigger her world took up more and more paper. I wanted to hold on to that first purple scribble, pull it close to my chest, and remember how it made me feel to become a dad. But when I did, I felt like I missed the fact that she rewrites that contract every day. I knew that they were just papers, and that the little squirt that drew on them had morphed into something even more magnificent. Still, I didn’t feel a sense of loss of my little girl when I looked at her drawings. I felt a sense of emotional geography. I could see how far she’d come. I could see how far Stevie and I had come. A few weeks ago, I was cleaning off the top of the fridge and found an extra stack of drawings I hadn’t looked at in months. I flipped through them, traced my finger over the textured wax, and smiled thinking about the look on her face when had I put them on the fridge. Then I did something that even surprised me. 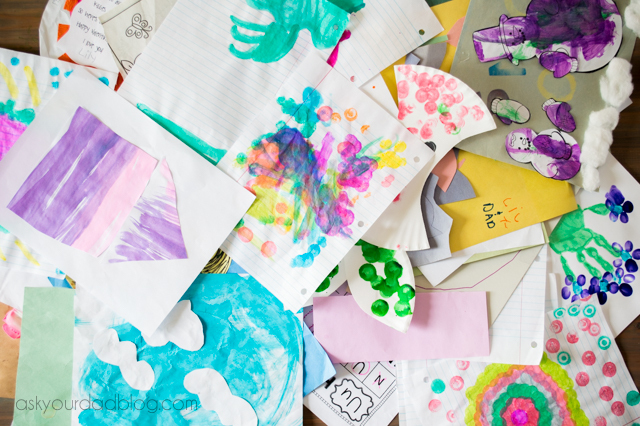 Instead of walking over to the garbage, pausing, and walking away, I quickly crumpled the handful of drawings into a ball and shoved them deep enough into the trashcan that I wouldn’t have the chance to see them sitting on top of the pile and pull them out. Then I washed my hands. Then I felt guilty. In that moment I realized that what I had thrown away was just paper and wax. That smile. That smile on her face when I had thanked my little girl and praised her hard work. That was my art, and it was safely tucked away in a place much safer than the top of my fridge. I don’t have to look at circles and trees and suns and flowers to connect with how far we’ve come. I just have to look at her. I still have my favorites. They are hanging on the wall next to me as I write this. But now I don’t feel as bad tossing out the majority of them. They are not all art. They are the beautiful byproduct of art. They are leaves from a tree that has a very long time to grow. Instead of drawing last night, Duchess asked us if she could show off her sweet, new number skills by counting by fives to a hundred. Far be it for me to deny her the opportunity to count by fives. We put away the colored pencils and Stevie, Captain and I sat attentively. She did it so fast the numbers blended together. We listened in amazement as she hit a rhythm punctuating the “ty” on every other number. When she hit 100 she shouted it like it was the top of a mountain. ONE HUNDRED!! We clapped loudly for her and she did her proud little giggle. She stopped saying “fiveteen” a year ago and now we’re into the hundreds. She’s counting faster than our hearts can keep up. That’s a lie. We can keep up. We will keep up. Sure, I can’t pin her counting to the fridge or put it in a box, but she can pin our clapping to her heart, and that is a lot harder to throw away. If you enjoyed this post, read more! I have a bunch linked in the sidebar. Also, be sure to like the Ask Your Dad Facebook Page. We have a lot of fun over there and I promise not to throw away your art. Also, thanks to Chris over at LunarBaboon for letting me use his fantastic comic. He's a great friend, and an amazing artist. Be sure to check him out. Nice - love the perspective. I like the term emotional geography.